Amy Friend, DuringQuietTime.com, gave a workshop at the Proper Bostonian Quilters Guild in October. The workshop was based on her book, Improv Paper Piecing, A Modern Approach to Quilt Piecing. The goal of the class was to create a paper pieced quilt block design that was improvisational. That block could then be set into a quilt setting of your own choosing. Amy provided sheets of copy paper with some basic outlines to help folks start a design of their own. Squares are the easiest block because they can be rotated in any direction and will still fit together. Rectangles are more challenging because they can’t do that. I decided to design my own block, with a 1 to 2 ratio. 2 of my 3 inch x 6 inch rectangular blocks together make a 6 inch square block. It’s sort of having my cake and eating it too! Amy has a great method for paper piecing which is a whole lot easier than the traditional method. It’s outlined in her book. But if you get a chance, take her workshop—it really helps to have her show you how to do it with paper, fabric and a light box! I decided to make a complete project on the workshop day, so I opted to make a mini quilt/pillow cover. I used 4 blocks, stacked vertically. I got all the piecing done during the workshop and finished 3/4 if the project. That was a good day! Because I picked a small project, I didn’t get to experiment with my square paired rectangular blocks. But with the power of EQ 8 (Electric Quilt 8) I can! Here are three layouts I tried using my blocks in EQ8. The layout options really are almost endless. 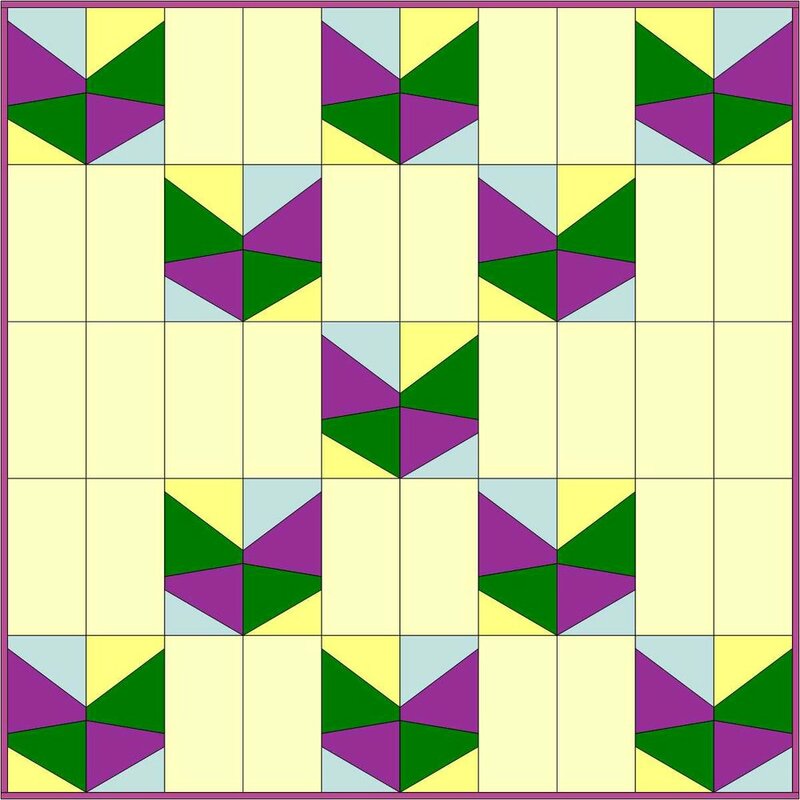 If you are wondering why none of the quilts designed in EQ8 look like the mini quilt, it is because one of the blocks in my mini quilt is a mirror image of the other three blocks. I really like it, but it’s there because I accidentally sewed a block using my original drawing rather than the reverse-mirror image block papers I had prepared for sewing! But this is improv…which means it’s all good!! I'm working on a Christmas quilt this week. I am using fabrics with fanciful mushrooms, and some elves, which I've been collecting for a while. Our family lived in Europe when I was a child. As transplanted Americans, our family was delighted by the red mushrooms with white polka dots on their caps which are used as Christmas decorations throughout Europe. These mushrooms are Amanita muscaria and they really are beautiful. (The results of a quick google search to learn why Amanita muscaria are used for holiday decorations: The child-friendly explanation is that they are a symbol of good luck for the New Year and a tribute to nature). I thought this story was worth the addition of a licensed photo so you can see these amazing mushrooms their natural habitat! Doesn't it look like a fairy might peek from the back of one of these mossy tree trunks at any moment? You can see why this mushroom species captures the imagination! For the quilt, I picked a template for a single block quilt in Electric Quilt 7 (EQ7). It's a star block. The finished quilt at present will be just over 50 inches square. I'm trying to add some Modern Quilt elements to this quilt--a bit of a challenge since I'm using Christmas and fairytale fabrics! I decided to build this star quilt as if it were a medallion quilt.The photo above is the center of the quilt. The paper pieced tree is a design from the EQ7 block library. I hadn't planned to use the fabric with the little trees, but it was in my stash and echoes the center tree so well that I had to include it! Here are a couple more elements in the quilt that are pieced and ready to use. Can you find the Amanita muscaria in the 4 patch blocks? The polka dot red mushroom is featured in the fabric on the right as well. I'm still working on the other blocks in this quilt. More to come in a later post!